Gum disease is much more common than you might think, and it can have some serious consequences! 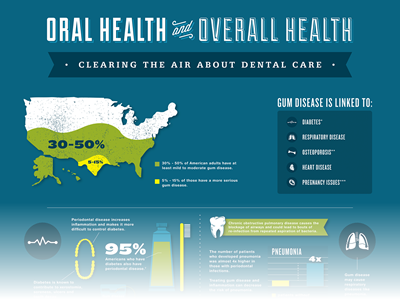 This infographic illustrates how gum disease can actually lead to heart disease, diabetes, respiratory disease and other major health problems. You could make a big difference in someone’s life if they’ve never heard this before. Spread the word and share this infographic with your friends! I think the official stats are that perhaps as many as 3 out of every 4 people have either gingivitis or gum disease right now. If true, it is very sad. I remember reading on the Mayo Clinic’s website once that 95% of people over the age of 65 have it as well. If you know a hygienist, she will be able to tell you how many of her patients have it and if people knew the number, they would be shocked! It shows that a small gum problem may lead to some serious disease if it’s not care properly at early stage. So people take care of your teeth seriously. Umm….Good to know. I think I’m going to go brush my teeth now. Who knew staying healthy was that easy!